The Avalon Archive consists of digitized media scanned from source materials which document the history of Avalon and will continually be expanding. 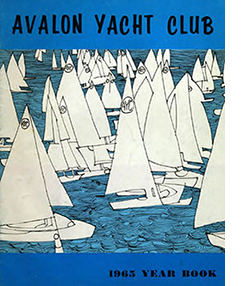 Currently, the collection includes Avalon Yacht Club Yearbooks starting in 1951-2007, The History of Avalon by Robert Matt and John Fallon's "World War II Memories of A Combat Engineer" , Army Engineer Magazine, November-December, 2009. For optimum performance, use the latest version of Microsoft Internet Explorer and Adobe Reader. In Adobe Reader, change the properties for "web view" by going to edit/tools and checking the fast web view box. The New Jersey Digital Highway is your "one stop shop" for New Jersey history and culture, from the collections of NJ libraries, museums, archives and historical societies. Digitized information includes text, pictorial, audio and video. This collection consists of digitized non-fiction books and novels that represent the broad and rich history of New Jersey. Ebooks for reference in various topics including biography, education, medicine, literature, law, religion, science, social science and more. Search all books in one convenient search box and download to your iPad or your computer. EBSCOhost includes an encyclopedia, thousands of magazine and journal articles, education resources, grade-level specific materials for schoolchildren, medical information and much, much more, EBSCOhost is very often the only database you need. EBSCO provides cloud-storage for your bookmarked articles, and allows you to email articles in addition to printing. Search local, state, national and international news media for full-text articles with diverse source types including print and online newspapers, blogs, journals, newswires, broadcast transcripts and videos. Explore a specific issues, events or compare a wide variety of viewpoints on topics such as business, health, education, government, history, politics and more. Among the many newpapers covered by NewsBank, are The Philadelphia Inquirer (1981 - present), the Press of Atlantic City (1988 - Present) and USA Today (7/1/1987 - Present). Newsbank covers many news sources in Pennsylvania, New Jersey, Delaware and Florida. FamilySearch.org is one of the most popular genealogical resources in the world. The site is sponsored by The Church of Jesus Christ of Latter-day Saints and is free and available to the public. Visitors to FamilySearch.org can search over two billion digital images and indexes of records from all over the world. These records include government and church records for births, marriages, and deaths; censuses; probate records, land records, draft cards; and so forth. Millions of new records are published on a weekly basis. Patrons may freely access our resources and service online at FamilySearch.org, or through over 4,500 family history centers in 70 countries, including the renowned Family History Library in Salt Lake City, Utah. HeritageQuest® Online is a comprehensive treasury of American genealogical sources—rich in unique primary sources, local and family histories, and finding aids. Discover the amazing history of you with HeritageQuest Online. It delivers an essential collection of genealogical and historical sources—with coverage dating back to the 1700s—that can help people find their ancestors and discover a place’s past. HeritageQuest accesses: US Census data, genealogical and history books, Periodical Source Index (PERSI), Revolutionary War records, Freedman's Bank records, and LexisNexis US Serial set.